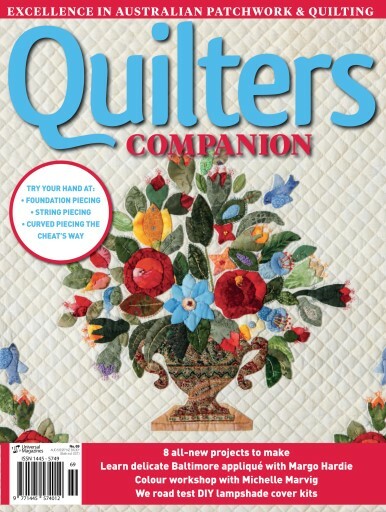 We have a huge range of different patchwork styles to try your hand at this issue. Kristy Lea presents an adorable foundation-pieced star cot quilt and Chris Jurd returns with a string-pieced quilt with Asian inspiration. We have a quilt from Carol Lewis, who has taken inspiration from a recent display of antique quilts for her project, and we will be given a lesson in traditional Baltimore appliqué by Margo Hardie. Finally, Emma Jansen, who has made a quilt from her own stunning Terra Australis fabric range. We also present a great colour lesson with Michelle Marvig. There will be much more to learn about and make, so join us again.